ManMohan Sodhi, Professor of Operations and Supply Chain Management commented on climate change and how the rise of natural disasters could impact the US economy. "With President Trump now in office, there are fears that he may undo global efforts – weak as they are – to mitigate climate change. However, it will be in the interest of US multinationals, as well as of those living in the US (the specific stakeholders the incoming President seeks to represent), to support and indeed bolster climate-change cooperation. "This is not only because climate change is literally disastrous for the planet, but also because the total number of people affected, in addition to the total property damage due to climate-related disasters, has been rising exponentially over the past few decades. "Also, among the countries most affected by this is the USA and the continent most affected is Asia, where many US multinationals have manufacturing. This makes climate change a huge US issue, especially economically. Analysing the period 1965-2015, nearly all of the cumulative property damage and the most number of people affected by natural disasters were caused by floods, droughts, storms and earthquakes. Of these, the first three (and some other disaster types such as extreme heat) are climate-related. If we look at the cumulative property damage for more recent years, 2000-2015, the country with the highest damage is the USA. While China, India and Bangladesh lead in the cumulative total of people affected by natural disasters, the USA is close behind these ‘leaders’. Furthermore, while Asia as a continent, is far ahead of other continents when it comes to the total number of people affected (2000-2015), North America is not far behind in property damage and will likely exceed other continents in the years to come based on trends. 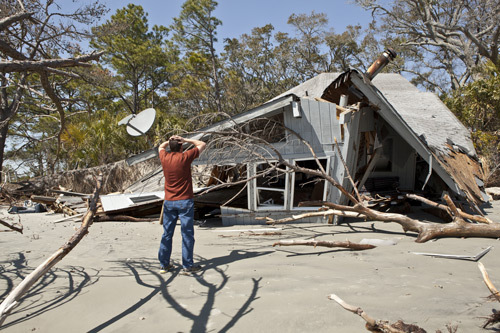 The trend of property damage (1965-2015) due to climate-related natural disasters, such as floods and storms, shows growth of about $25 billion per decade. In comparison, for non-climate-related disasters such as earthquakes, the figure is less than $10 billion per decade. The contrast is sharper for the total number of people affected globally: the growth is about 40 million more people per decade due to climate-related disasters compared to a negligible increase in the number of people affected by non-climate-related disasters. The trends are more pronounced for Asia and North America - the former for the number of people affected and the latter for property damage, so North America stands to be the ‘leader’ in property damage due to climate-related disasters in the coming years. "This analysis only ‘correlates’ the impact of climate-related disasters as well as non-climate ones but in recently published research, I have provided empirical evidence that disasters and the economy are related in a vicious cycle. "So if disasters are primarily becoming climate-related, the incoming US administration should take heed that the economy, especially that of the US will suffer greatly if climate change is not reversed or at least slowed." Bobby Banerjee, Professor of Management commented on how US climate and energy policy look under Trump’s administration. "Donald J. Trump has been sworn in as the 45th President of the United States. For climate change activists and environmentalists the future looks dire. 2016 was the hottest year on record and 16 of the 17 hottest years have been recorded since 2000. 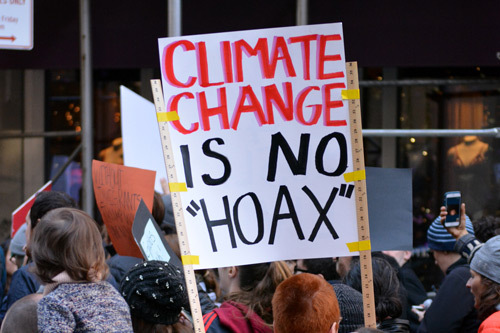 And from this Friday global leadership on climate change will be taken over by a man who claims climate change was a ‘hoax’; that the ‘concept of global warming was created for and by the Chinese’ and who threatened to ‘cancel’ the 2015 Paris agreement to limit climate change. And if the optimists among us feel these were populist campaign promises and that there would be a difference in his climate policy as he moves from campaigning to governing, the early signs are grim. "Trump nominated former Governor of Texas, Rick Perry, as Energy Secretary, who once called climate change ‘a contrived phony mess’. Other notable appointees include prominent climate sceptic Myron Ebell who heads the Environmental Protection Agency transition team and Oklahoma Attorney General, Scott Pruitt, a close ally of the fossil fuel industry to head the EPA. "Mr Pruitt’s nomination and ongoing Senate confirmation hearing has been described as ‘surreal’ by political commentators: he has sued the EPA 14 times over the last six years and describes himself as a ‘leading advocate against the EPA’s activist agenda’. And he will working for a boss who promised to get rid of the EPA ‘in almost every form’." "Will Trump actually have the power to carry out his promises? What would the climate agenda look like under a Trump administration? Let’s take the landmark Paris agreement. President Obama unilaterally ratified the Paris accord without Senate approval and in theory Trump could sign an executive order withdrawing the US from the agreement on his first day in office. However, legal and policy experts claim it would take at least four years for the US to formally back out of the agreement. "What this means is that the US pledge to reduce its greenhouse gas emissions by 26 to 28% below their 2005 level by 2025 would no longer be binding. This could have ripple effects on other countries who would be less likely to cut their emissions. China, already a world leader in renewable energy, would gain strategically from a US withdrawal and would gain credibility as they have pledged to continue to support the Paris accord. "A Trump administration would most definitely reverse the Obama administration’s climate and energy policy. The US’s course on energy policy would see a significant shift towards more fossil fuel extraction through opening up of federal lands for oil and gas drilling and coal mining. Trump’s campaign promise to revive the coal industry will probably remain unfulfilled not for environmental reasons but more because low gas prices have made coal an uneconomical choice. "One thing is certain: with a compliant Republican congress the considerable power that the oil and gas lobby holds over US politics will increase substantially. And that is not good news for the planet."